Andrew Borrego punches the mitts in the ring during a recent training session. In 2010, Andrew Borrego took a look at his life and where he was heading. He didn’t like the way he was dealing with the pressure of being an attorney and decided to take a proactive step to handling his stress: by punching it square in the face. Borrego now dons his boxing gloves four to five times a week and works out his stress hitting the bag, punching the mitts, and sparring in the ring. Though there’s the occasional bump, bruise, or fractured rib, Borrego loves walking into the gym and the camaraderie among his fellow boxers. What made you decide to pursue boxing? I try to train about four or five times a week. I do strength training and I also incorporate boxing. Yesterday was a boxing day, today I’ll take off, and then I’ll be back at it next week. I try to spar at least one or two days during the week. So we do bag work, mitt work, and then try to find a sparring partner to get in there and move around and get beat up. I’m the old guy there, so it’s fun. Do you have bouts or do you just spar? I did one charity event back in 2012. I don’t compete, although there is competition in my age level—I believe up to the age of 80. We do have a fighter in our gym who is a fellow lawyer—about 76 now—and he tries to compete. I haven’t competed. I like to spar with different guys that are at the gym—typically my trainer. We change it up and it’s fun to do. Tell me about the charity event. I fought in the Freeman Coliseum in San Antonio, which is a pretty big venue. So to do that, coming into an audience, was really fun. It was a great experience, probably the first time I fought in front of folks. I thought I won the fight, but the judges didn’t see it that way. But it keeps me motivated—it probably still drives me I’m so competitive. It’s something I’d definitely do again. 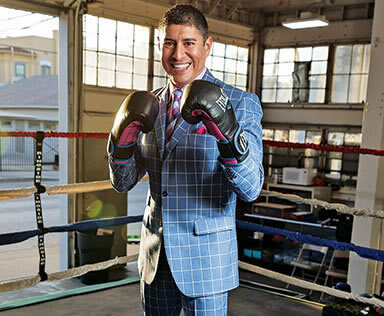 San Antonio attorney Andrew Borrego focuses on his well-being by stepping into the ring. Boxing is a rather taxing sport. What do you do to keep yourself in shape? I live a pretty clean life. I don’t smoke and I don’t really drink—like most people, only social drinking. I try to eat as healthy as possible. I’m 45, and in my mind, I think I’m 25, except for when I get home and start feeling the aches and pains. Typically what I do is cryotherapy, which is like an ice bath and helps inflammation. I do strength training in the morning so I can keep my core strong and get my stamina up. When I box, it’s a lot of stamina. I think boxing is the best workout for anyone of any age. As lawyers we have such a demanding profession. I think oftentimes folks drink and unfortunately get into addiction. Or you can choose to exercise and workout and deal with stress that way. With boxing—when you get in there—you’re really focused, you’re working hard, and it keeps you sane. Boxing not only helps physically but also mentally. Any injuries from training or sparring? Broken ribs. I got hit one time—my own fault, not protecting myself properly—and ended up with a fractured rib. That was painful. I often joke that I’d rather get hit in the head than the body. Body shots are brutal, but I don’t know that it’s good for me. We try not to hurt each other, but it’s boxing, so you’re going to get caught and beat up a little bit. Fortunately, that’s the extent of my injuries, but you’re always aching. It’s a passion though, and once you pick it up, you have fun with it. What would you consider the most difficult part? The most difficult part would be the mental aspect. Most people don’t realize that boxing is a lot of core and a lot of legs, so you can punch properly. But I think the mental part about it is learning how to stay calm in a difficult situation. Boxing actually taught me that. In life, you think you have a plan. Mike Tyson said, “Everyone has a plan until they get punched in the mouth.” It’s very true about life. In boxing, you get in there and the punches start coming or the pressure is on you. It’s learning how to stay calm in the midst of a storm. It’s the same thing with life. Things don’t always go as planned, and boxing helps you learn how to remain calm and how to take a step back—sometimes it’s moving side to side, sometimes it’s moving back, sometimes it’s punching forward. As is typical in life, you get knocked down and you get back up. You lose a case, you get back up and regroup. I think the mental part about it is something that really challenged me and taught me a lot about myself.